I've read through the DIYs before I ever even started acquiring saws, and found them to be insanely helpful. They are part of what gave me the confidence to bid on a lot of junkers and expect to rehab at least some of them, and the fine care that you describe will be perfect to use once I find that rare 'jewel in the rough' that's worth a more delicate touch. Hell, I would've never dared to flex a saw heel-to-toe until I'd seen that one pic of you doing it. 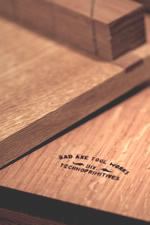 Maintain your saws using products we use every day--and here's how: just download our .pdf, Demystifying the Traditional Backsaw. The first half of the presentation shows you step-by-step how to clean and restore your sawplate, handle, saw back and fasteners back into a fully-tuned saw ready for another century's worth of use by you and those who succeed you in future generations. 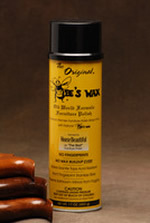 You'll also find many of the products listed below and how it is we use them. No, there are no kickbacks from the supplier--they're just good products we vouch for which have stood the test of time, because we clean and restore saws every day. Note: Cannot ship outside of the continental U.S. Contrary to popular belief, the kind of paraphernalia we offer for your saw addictions do not include glass pipes, tourniquets and dirty needles; rather, nicely contained here in a Bad Axe coffee mug is what you need to get started cleaning up your latest eBay purchase in your ongoing quest for vintage saw nirvana. I call this concoction a Bad Axe Saw MoM (aka Mug o' Maintenance). Included with this compact, yet replete saw maintenance kit are coarse and fine abrasive pads, a dynamite rust eraser block, the best polish and surface protectant I've found for saw steel yet, and a sunshine cloth for buffing up your fasteners. Also included small tool-wise are an exacto knife, razor scraper and dental pick for carefully ridding your vintage handle and fasteners of a century's worth of accumulated grime, paint splatters and other such filth that just doesn't belong on your newly acquired Disston Acme 120. I've also included a 36" x 24" sheet of vapor-corrosion-inhibitor (VCI) paper for use when you wrap up a sawplate for extended storage. 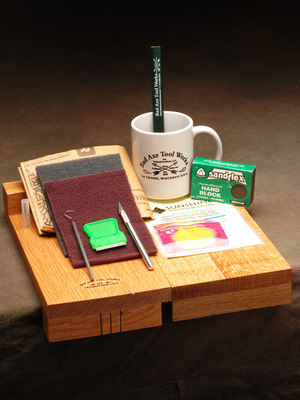 Heck, you even get an official Bad Axe Tool Works carpenter pencil--how about that? 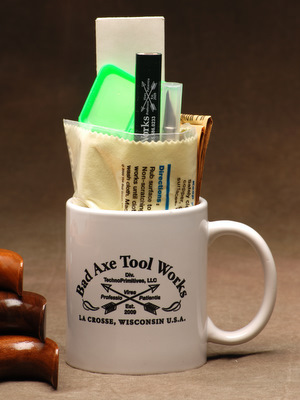 All nicely packaged in a Bad Axe coffee mug for the muddy Joe of your choice. For those of you who haven 't reviewed my DIY articles on how to clean a sawplate and restoring a saw handle, these links will take you there, where you'll see how I use many of the included items in your new mug o' saw maintenance (Bad Axe Bench Hook and vintage Wheeler Madden Clemson 12" carcase saw in the background not included :). 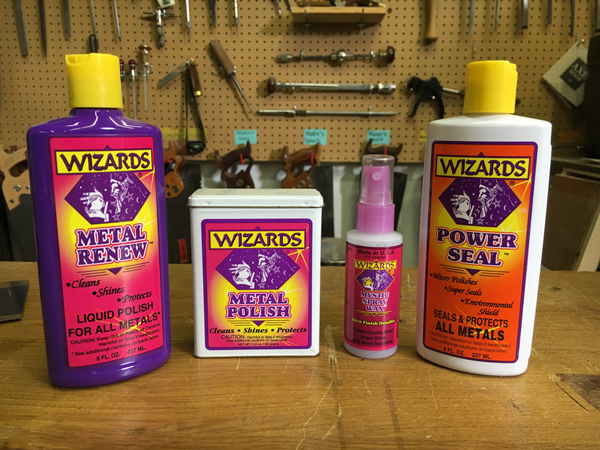 Wizard's Metal Renew gets the grunt work done when scrubbing a century's worth of rust--all you need is plenty of elbow grease. .
Wizard's 'Mystic Wax Spray is a synthetic wax using nano technology to put on a final glisten on your blade that serves as both lubricant and protectant. It makes a noticeable difference deep in the cut. Wizard's metal Polish is what you'll reach for after removing rust and scale with the metal renew, and will put a great shine on the metal. Format is impregnated in cotton, torn off in size required. Power Seal is best used after scrubbing your plate clean with the Metal Renew and Metal Polish. It seals the pores and barricades your sawplate against rust--a good preventative in coastal areas.